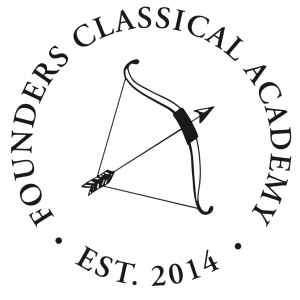 At the end of our third year, Founders Classical Academy of Leander was honored with the Salvatori Prize for Excellence in Teaching. The award came with a $25,000 prize, and earlier this year some of those funds went toward the purchase of a telescope and an air track for the science department. Several weeks ago I visited Mr. Berndt’s 11th grade physics class to see the air track in action. Mr. Berndt was demonstrating that mechanical energy is a conserved quantity within a closed system and in the absence of friction. First, the class saw that kinetic energy is always conserved for ideal colliding bodies, even if it is differently distributed between mass and velocity. Second, they saw that there is further conservation between gravitational potential energy and kinetic energy, and that both of these quantities are somehow measures of one and the same thing. Finally, Mr. Berndt demonstrated that there is even total conservation between gravitational potential energy, kinetic energy, and elastic potential energy. Although these experiments do not tell us what energy is, they do suggest that by considering motion and change in terms of energy transfers, we are approaching one of the most fundamental and universal principles of material being. These experiments also show us that although physical laws may be abstractions based on particular physical events, they are no less true for being ideal.